Airbus’s Emirates deal to save the A380 has stalled because of an engine problem: the Rolls-Royce engine is not meeting its performance guarantee! ANA's flight operations with the A380 are set, as aviation portal AirTransportWorld reports. As already known, the two Airbuses will connect Tokio (NRT) with Honolulu (HNL). The first delivered A380 will conduct its first commercial flight on 29 May 2019 and will take over 3 of the 14 weekly connections between NRT-HNL. With the arrival of the second A380 (first flight set for 1 July 2019), the Airbuses will take over 10 of the 14 weekly flights between the Japanese capital and Hawaii. This one sill remain idle for quite some time: ANA All Nippon Airways will start A380 service from Tokyo Narita to Honolulu only on 24 May 2019. Airbus removed orders for 10 A380s which had previously been allocated to an undisclosed customer. These aircraft had previously been linked to Hong Kong Airlines. Qantas has finally cancelled the remaining 8 A380s that it still had on order. As written by André yesterday, and confirmed today: Airbus to end A380 production in 2021 and Emirates orders 40 A330-900 and 30 A350-900 instead. Meaning the world wants more airports, more frequencies, not bigger planes. Im not sure its good for dubai's mega hub or chineese busiest cities, but its good for everyone else ! 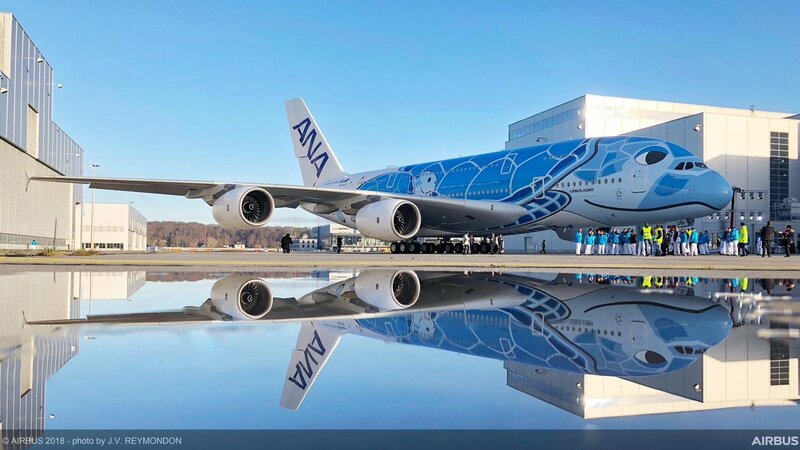 3 A380 still to be build for Japan’s largest airline ANA. I know this is an aviation enthusiast site and people prefer to look at the planes rather than the numbers behind them, but in the end Airbus is a commercial company and it is in this business to make money, not emblematic planes. Airbus CEO Tom Enders is clearly kitchen-sinking costs from problem programs that have dragged on for years as he prepares to leave the company after this year’s annual shareholder meeting, thus cleaning out all his closets. In addition to terminating the A380 superjumbo at a cost of 463 million euros, Airbus also announced it booked a charge of 436 million euros after reaching an agreement with government customers on revamping the A400M program. It also expensed 123 million euros for compliance issues and 81 million euros in unspecified additional costs. Adding to the landslide of revelations on Thursday was news that Abu Dhabi-based Etihad Airways will cut an order for the latest A350 wide-bodies by 42 planes. Nevertheless, Airbus posted an adjusted profit of 5.8 billion euros in 2018 on sales worth 64 billion euros, and raised its dividend payment to 1.65 euros per share. In his final results statement, Enders, 60, predicted a 15 percent gain in earnings for this year and said he was leaving behind a company that’s on a “solid growth trajectory”. Defense and helicopter arms that have long struggled for sales are now also “in good shape” for Faury and his team to take over, he said. Airbus shares advanced as much as 5.4 percent when stockmarkets opened with the stream of news from Toulouse this morning, the biggest advance in more than a month. Airbus was up no less than 5.1 percent to 109.74 euros at 9:03 a.m. in Paris, taking gains for the year to about 30 percent even. The 2019 outlook is above consensus and makes Airbus the “favorite in waiting” among European capital goods stocks for this year, according to many analysts. As dull as it may be, but a spreadsheet untimately always wins from emotions and sentiments, also in aviation, no matter how much awe, history or love people may feel for a plane, an airline or a route, something I've noticed on many occasions isn't fully grasped by people posting on this site, so although many will say this is a sad day for Airbus, it's actually a very good one, as evidenced by the market reaction to their strategic long term decisions. Qatar Airways CEO said it will phase out A380 in six years time, the first carrier to do so. Just back from DXB, this lineup of whale jets on the apron is really an impressive sight that will remain a vibrant memory for a long time. I'm happy I could live this adventute throughout, as an aviation enthusiast I can only feel disappointed from this expected but still painful outcome. Of course the concept from the start was dubious, the plane not versatile enough to gain the needed traction on the market place. Thank you Airbus this exceptional bird made me dream, and you got a well earned brand recognition in the industry and beyond. This achievement alone is priceless. Whereas Boeing's dreamliner will never make me dream.. the PR marketing stuff can't beat the real thing. Germany is in talks with Airbus about €600 million in outstanding loans advanced for development of the A380, which the planemaker now plans to scrap. Germany will never be the last to want its money back (remember Greece). German government is looking for ways to recover loans awarded to Airbus for the development of the A380, and is now working with a law firm.